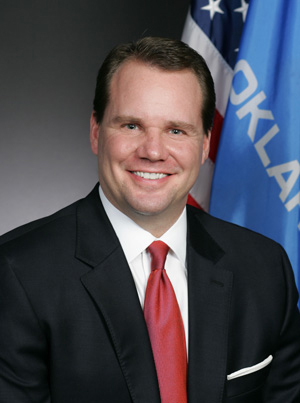 “Don’t leave Oklahoma,” was the main thread spun through a talk given by Lt. Gov. Todd Lamb on Tuesday. Lamb came at the invitation of his fellow party members in the OCCC College Republicans, and spoke to an audience of college officials, faculty and students about the growth he believes is coming to Oklahoma. The first third, he said, is his role under the state constitution, working with the legislature and handling the governor’s duties when necessary. The duties assigned by the governor make up the second third, Lamb said. “As some of you may remember from high school, the governor and the lieutenant governor are elected separately. So they don’t always necessarily like each other,” he said. In that role, Lamb said, he represents the entire small business community in Oklahoma, which is 97 percent of the business community as a whole. But it was the final third that wove through the entire talk. “The last third is my passions — the tasks and dreams I want to accomplish. And what I dream about, what I want to see, is Oklahoma beat Texas in something other than football,” Lamb said. “We have growth coming, a renaissance, in so many areas. Lamb said when he gives commencement speeches, he stresses that the opportunities are coming, are already here in some cases, and not to leave the state. “And for those students that may have gotten a job offer out of state, I always say, ‘go, but hurry back!’” he said. Those opportunities are coming from all directions, he said. “Yes when we think of growth, we think of agriculture, and oil and natural gas. And those will always be important because of what we grow in the ground and what we have in the ground. Lamb said he has a very specific vision.